Pizza Pizza franchise business opportunity. 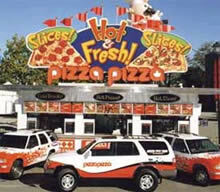 Free Pizza Pizza business franchise information. You're looking for an opportunity that combines the best of both worlds-the opportunity to operate your own business, with the security of an established name and product behind you. You're looking to achieve financial security; to build equity for your future. Canada's most successful pizza chain can give you the freedom to be your own boss, under the umbrella of Canada's most recognizable pizza company. Pizza Pizza maintains over 30% of market share in Ontario's pizza industry. We have over 400 restaurants across Canada, operated by professionals who share the same core values that have made Pizza Pizza the most successful pizza chain in Ontario. The commitment to quality, service excellence, customer satisfaction and innovation has been the driving force behind Pizza Pizza. We offer the freedom to be your own boss under the umbrella of the most recognized and respected Pizza Company in Ontario. Achieve financial stability. Build equity for you and your family. Complete turnkey operation includes comprehensive training and operational support. To learn more about the Pizza Pizza franchise opportunity, simply complete the form below.